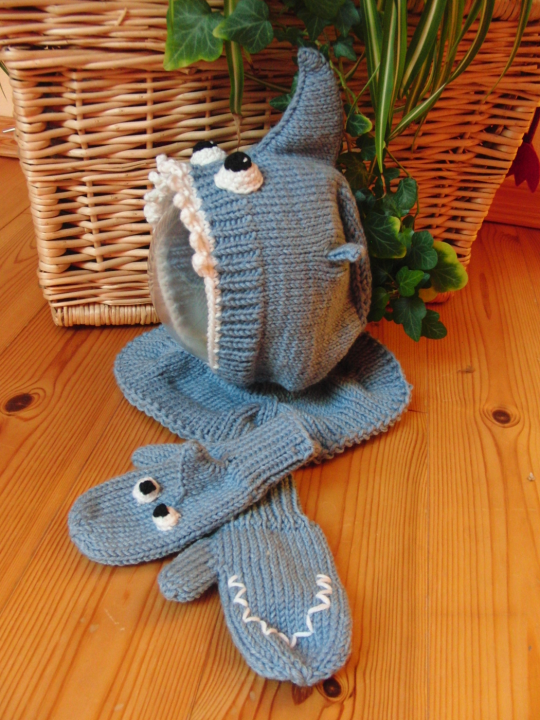 Shark Attack - monemades Webseite! We had a rainy and cold weekend and as much as I regretted we couldn't continue with our renovation works outdoors, as much did I enjoy the hours of leisure time. To knit, or rather to cast on lots of new projects... I think it's my Ravelry friend Shelley who is to 'blame', because she announced the 'August cast-on crazies' mid of August and even though I tried to stay away from the event, in the end I started to cast on stuff. Okay, I tried to stick to my goal to get the WIPs out of my knitting basket so some of my cast-ons were squares for my long neglected GAAA (and I even finished them which means I'm up to 19 squares now, so just one more and I've got a blanket the size shown in the book, although I had meant to knit the other 4 squares too and add them to my blanket, we'll see), but I also cast on things just for fun. A while ago I was gifted a book with knit 'monster hats' and I had wanted to at least knit one of them since I got it... and I did. :) Including the matching mittens. So here comes a non-dangerous shark attack. Hi there! Do you still happen to have the pattern by any chance? The link is no longer available on Ravelry! my email is naterialist@gmail.com. If you have it by some stroke of luck, it would be sooooo appreciated if you could send it! THank you! Würdest du das Muster teilen (auf Englisch, wenn möglich)? Meine E-Mail-Adresse lautet janetalice@icloud.com. Vielen Dank!